"Palestinians Seek Apology for Balfour Declaration"
So reads a headline in today's Jerusalem Post, neatly summarizing a point I (among others) have been trying to make for years now (for example in the Los Angeles Times): the Palestinian problem with Israel is not over the size of the state, nor where its citizens live, nor over control of sanctities, nor over water resources, nor over armaments. It has to do, rather, with the very existence of the state. Here are choice excepts of "Palestinians Seek Apology for Balfour Declaration" by the talented Khaled Abu Toameh, covering the 86th anniversary of the Balfour Declaration – the British foreign secretary's 1917 announcement that "His Majesty's Government view with favour the establishment in Palestine of a national home for the Jewish people." Statements issued by different Palestinian factions, organizations, and officials demanded an apology from Britain, saying it is morally and legally responsible for the creation of Israel. The Palestinian Council for Defending Refugees' Rights said Britain must apologize for the injustice done to the Palestinians as a result of the creation of a Jewish state in Palestine. "We hold Britain responsible, morally and legally, for the injustice done to the Palestinian cause," the council said. "Britain is responsible for disarming our people prior to the establishment of the State of Israel, thus depriving our people of their right to self-determination and independence. Therefore, we are demanding that Britain apologize for what happened in Palestine." called on Palestinians and Arabs living in Britain to form special committees to put pressure on the British government to issue a similar declaration acknowledging the Palestinians' right to establish their own state. "Otherwise, the Palestinian people in their homeland and elsewhere would continue to hold Britain responsible for this crime in favor of Israel," he said. Given the inflamed state of views toward the Arab-Israeli conflict in Great Britain, it strikes this observer as entirely conceivable that the government there will indeed apologize, and perhaps not that many years from now. May 4, 2004 update: Plans by the Vienna municipality to name a square after Theodor Herzl, the man generally credited with founding the Zionist movement, drew a protest from the Arab League. The league sent a letter dated April 29 to the mayor expressing its "regret" at the decision to honor a man whose name "represents a sad memory for Arabs and Muslims," then urged city officials to reconsider this move for the sake of continued "good relations" with the Arab-Islamic world. The letter even suggested that the name change, timed to coincide with the 100th anniversary of Herzl's death on July 3, could lead to terrorism. (Carna Amina Baghajati, spokeswoman for Vienna's Islamic community, suggested that a square be named instead for Mohammad Asad, the Islamic name of an Austrian-born Jew born Leopold Weiss, 1900-92.) If it were needed, here is more proof of the intent to delegitimize the very existence of Israel. July 2, 2004 update: The square was in fact named after Herzl today, one day ahead of the exact centenary of his death. Apr. 17, 2008 update: The City of Vienna today named a square outside the main entrance of the United Nations headquarters "Muhammad Asad Platz." The organizers said it is the first square to be named after a Muslim in all of Western Europe. Mar. 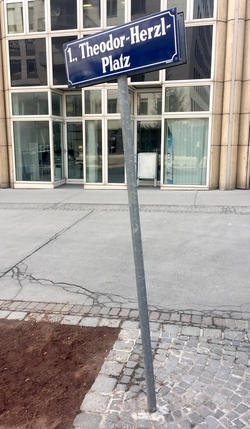 26, 2018 update: I visited "Theodor Herzl Platz" today and found it underwhelming; a single, weatherbeaten sign on a pole in the middle an unattractive, cemented lot. See my picture of it at right. 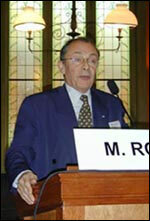 June 19, 2004 update: Michel Rocard, a former French prime minister and current member of the European Parliament, on June 16 described the Balfour Declaration as a "historic mistake" and blasted Israel as an "abnormal case in the world," according to a report today in the Palestinian Authority's news service, quoting Ash-Sharq al-Awsat newspaper. He described the Israeli state as a "unique and abnormal condition because it was created with a promise." Jews having gathered there has created "an entity that continues to pose a threat to its neighbors until today." Rocard, a Socialist Party leader, spoke these words in Egypt. Anomalously, Rocard then called for a peace agreement between the Arab states and Israel; its delay, he said, would "greatly increase violence in the region." Unlike his Arab counterparts, apparently, Rocard lacks the courage to follow through on his logic and call for the destruction of Israel. How much longer, I wonder, until French politicians feel free to say that? Mar. 5, 2013 update: Still angry about the Balfour Declaration, Palestinian students at Birzeit University near Ramallah attacked Sir Vincent Fean, the British consul general in Jerusalem (and de facto ambassador to the Palestinian Authority). Although he went to the university to "engage in an open dialogue," dozens of Palestinian students swarmed him, kicked him, and threw rocks at him, forcing Sir Vincent to cancel his planned speech, take refuge in his car, and rush off. The students pointed to the 1917 declaration as their chief grievance. "We asked the university to cancel his visit because Britain is the cause of the Palestinian tragedy," said Taha Afghani, leader of one of the student factions behind the protest. Apr. 17, 2013 update: Three days after news that the original 1917 Balfour Declaration, affirming British support for the establishment of a national home for the Jewish people in Palestine, will be placed temporarily on display in Tel Aviv in 2015, the Arab League weighed in with a condemnation. As paraphrased by Egypt Independent, the league "described the decision as leading to ongoing bloodshed and strife, as well as a denial of the Palestinian people's rights ... Palestinians are still paying the price for the declaration." July 4, 2014 update: The notorious British politician Jenny Tonge has sponsored a petition to the Her Majesty's Government titled "Britain Must Atone for its Historical Failure in Palestine." If it gets 100,000 signatures by March 31, 2015, it "could be debated in the House of Commons." So far, the petition has a measly 978 signatures. Dec. 14, 2014 update: With more than half the time elapsed, just 2,015 signatures. 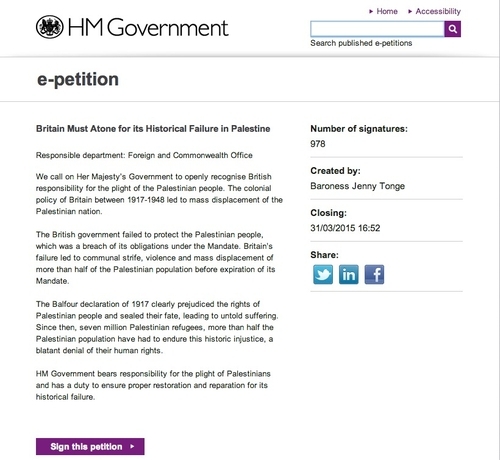 Jenny Tonge's epetition to the British government. Nov. 1, 2014 update: An organization called American Muslims for Palestine has picked up the theme with a press release, "Balfour Declaration at the heart of the assault on Al Aqsa; occupation of Palestine." It starts with usual boilerplate about the Balfour Declaration being "the catalyst for the Zionist enterprise that ate up Palestinian land and dispossessed two-thirds of its indigenous population to create the state of Israel." It concludes with an equally tedious appeal to "commemorate the 97th year since the Balfour Declaration by renewing our commitment to the just and noble cause of Palestine. We must demand: End the occupation now!"